Potholes will eventually form in every parking lot. These indentations develop as water moves below, causing expansion and contraction beneath the pavement. The pavement is gradually weakened through erosion and pooling water that eventually forces it to collapse as vehicles pass above, creating a pothole. Since moisture is almost always required for potholes to form, these holes typically form after periods of rain and other inclement weather. Potholes are more than a mere inconvenience. These pavement flaws are hazardous, dangerous and can lead to potential legal liability. 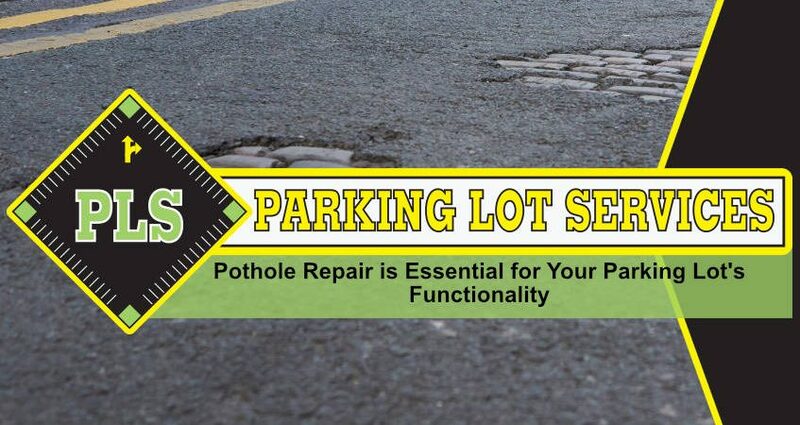 If you notice potholes forming in your parking lot, have professionals repair it right away. Prompt pothole repair will ensure the safety of you, your customers and your staff. Potholes should always be addressed sooner rather than later. The underlying cause of potholes is typically a water drainage issue or undulation of the parking lot. If you let potholes worsen rather than proactively address them, the repair project will gradually become more expensive as time progresses. Potholes that are ignored will slowly expand to the point that they damage automobiles and equipment. Do not delay your pothole repairs! You will spend less money to address potholes in their early stages rather than waiting until these problem spots expand to large holes. Add in the cost of repairing vehicles damaged by potholes and it makes even more sense to pay for pothole repair now as opposed to later. Your parking lot is one of the first things people notice when visiting your establishment. If your parking lot is laden with potholes or other imperfections, visitors will take note. The quality of your parking lot reflects on your business as a whole. By repairing potholes right away, you will make it clear to your customers that you value their safety as well as their business. Don’t think of potholes as merely an eyesore people can avoid. Potholes will send customers elsewhere, open you up to legal liability after injury/vehicle damage and ultimately reduce the value of your business. Above all, pothole repair should be performed right away as the safety of you, your customers and your workforce is at stake. A small pothole can trip an employee or customer, damage a vehicle or cause another injury that you will be responsible for. Even if your insurance covers the cost of related expenses, your premium will increase after a claim. You can completely eliminate the potential for this legal liability through pothole repair services as soon as potholes appear in your parking lot. Work with the right asphalt paving and sealing company for pothole repair and you will rest easy knowing your parking lot is in top shape throughout the entirety of the year. Does your parking lot have potholes? Let PLS repair your parking lot before the damage becomes irreversible. We provide asphalt sealcoating in Tampa, pothole repair, paving services and more. Contact PLS today at (813) 880-9100 to schedule a no-cost consultation.